Hannah is the lead pharmacist for Clinical Informatics at the Royal Free London NHS Foundation Trust. She qualified as a pharmacist in 2015 and spent 3 years rotating through various clinical specialties including; Elderly Care, Maternity, Neonatal Medicine, Paediatrics and Surgical Specialties. In January 2018 she joined the Electronic Patient Record (EPR) team to help deploy electronic prescribing across the Trust. 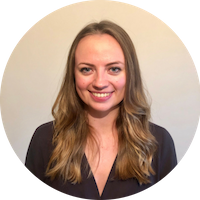 Hannah has a keen interest in electronic prescribing and medication administration (ePMA) systems in the secondary care setting and enjoys working closely with clinicians to seek out and design new digital prescribing workflows. Problem: Different patients with the same diagnosis are not receiving consistent care across sites. EPR is live at Barnet Hospital (BH), Chase Farm Hospital (CFH) and the maternity department at the Royal Free Hospital (RFH). Further roll out is scheduled for the rest of RFH across 2019/2020. The digital transformation project is still in its early stages and there is substantial work to be done in order to standardise pathways across the Trust ready for implementation at RFH. In addition, ensuring continued engagement and adoption from the staff and patients who use EPR is challenging. Solution: The Trust has identified 40 clinical pathways covering 70% of our total activity. Hannah will be working with clinicians to digitally develop CPG pathways to help drive out unwarranted clinical variation. The project will test and implement 20 of these pathways in 2019 across sites. Complex prescribing plans will continue to be developed with clinicians and medication clinical decision support (mCDS) tools will be developed to aid prescribing decisions and improve user acceptance. Scale: RFL is one of the largest UK Trusts delivering care to more than 1.6 million patients each year across three main hospitals: BH (440 beds), CFH (159 beds) and RFH (830 beds). The next stage of the project will involve the EPR role out at the largest site, RFH. Desired impact: The Trust’s aim is to become the most digitally advanced trust in the UK by 2020. Developing and implementing a single harmonised EPR across all hospital sites will aim to reduce unwarranted clinical variation and ensure patients receive the best standard of care, wherever they are treated. Progress to date: EPR is live at all sites except RFH. The RFH project will commence in February 2019 with the aim to complete roll out by early 2020.